The Golden Circle tour is the most popular day tour in Iceland and this is the best priced Golden Circle bus tour you will find. In a single day you will see three of Iceland's most famous sights. You will see Geyser Strokkur the world famous erupting geyser & geothermal hot spring area in Haukadalur. Experience the magnificent Gullfoss one of Icelands largest and most beautiful waterfall. Walk down the lava canyon in Þingvellir national park, Icelands most historic site. Geysir is a collection of hot springs in Haukadalur, a geothermal area in the south west of Iceland. The most famous geyser Strokkur erupts every 6-10 minutes and shoots hot water 20 meters (70 feet) up in the air. This natural phenomenon and display of volcanic power is truly amazing. 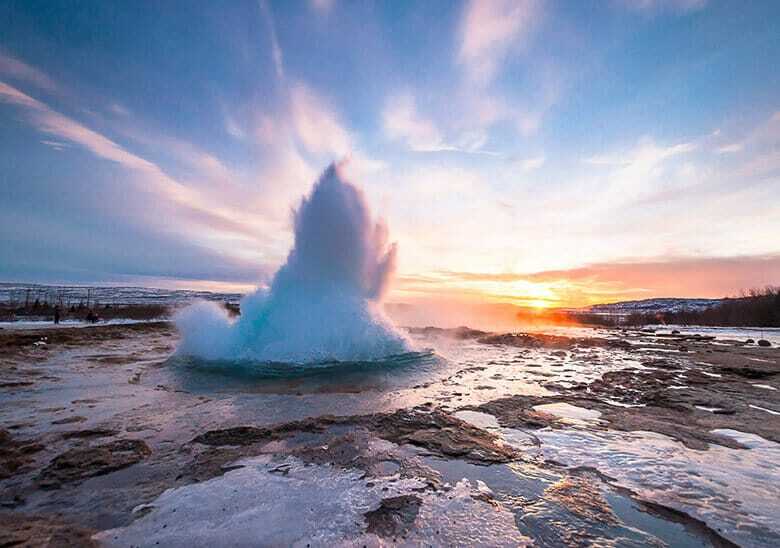 Seeing a geyser erupt is a sight that can't be missed for anyone visiting Iceland. The geysers are in an area called Haukadalur about 1 hour and 30 minutes from Reykjavik. Once you are there you will see steam rising from the ground. Many hotsprings and hot rivers are located in the area. Gullfoss (Golden falls) is one of Icelands most majestic waterfalls. The waterfall originates in the Langjökull glacier and gets it's name from the gold hue it gives off as it tumbles downward into the canyon. The waterfall drops down into a crevice of 32 meters (105 ft) in two steps being 11 meters and 21 meters each. On many occasions rainbows can be observed dancing across the top of this magnificent sight. Gullfoss has an interesting history that involves investors trying to harness its awesome power. The waterfall can viewed from a few different locations. The upper deck next to the visitor center gives a great view from above. By walking down the staircase the waterfall can be viewed from the lower deck. From there the waterfall seems to vanish into the earth. From the lower deck you can walk a path that leads towards the first plunge of the waterfall. This will give you a great view into the crevice and a feeling of the true power of the waterfall. This path can be closed if the path is icy and conditions are not good. Þingvellir National Park (Thingvellir) is Icelands most historic site. This is where the worlds first parliament was established by the vikings in 930 AD. Thingvellir was designated as a world heritage site in 2004. Þingvellir is also a natural treasure with it's vast lava fields and rivers leading into Icelands largest lake. The Þingvellir valley has been an inspiration for numerous painters and photographers alike. Starting from the visitor center you walk out to the scenic deck known as Hakið where you can and witness the magnificent lava formation. You can almost witness the continental drift as you take a walk between the American and Eurasian tectonic plates. As you walk down towards the valley you can read interesting tidbits about our history, viking era and how the laws of the land were established. The all new bus fleet is equipped with WiFi connected computer tablets in each seat. On the tablets you can use the Audio Guide that will will tell you interesting facts about Iceland and the places you are travelling through. The audio guide is available in 10 languages: English, French, German, Dutch, Italian, Spanish, Chinese, Japanese, Korean and Finnish. The last stop is Gullfoss Waterfall, an awesome sight to behold. Here a powerful glacial river cascades down 32 meters on two levels and into a narrow canyon with a thunderous roar. This tour is 7.5 hours long including travel time and the time you spend at each location. You spend at least 45 minutes at the major stops giving you plenty of time to enjoy the nature and to take some pictures. Lunch is not included, In Geysir & Gullfoss there are shops where you can buy food and drinks.